"Kindly compare and buy only Govt. Certified (IGI-GTL) or world repute labs (Like GIA, IGI, GRS, AGS, GII, Etc.) certified Emerald Gemstones only. Because only these labs (Not the private or affiliated labs opened now-a-days) have the latest and the most advanced equipments to test these gemstones for the various treatments that are being done on them to enhance its color and clarity to dupe and cheat people." 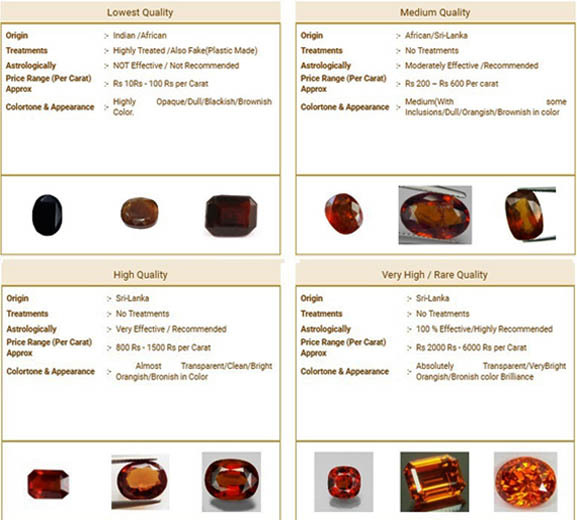 Hessonite -The Hessonite gemstones are also called as (Gomed) stones in Hindi. As per regional differences it is also called as Gomedh or “Gomedak” in Sanskrit. It comes in reddish – brown orangish color. It is the silicate of the zirconium commonly found in igneous rock but fairy rare as a gemstone. It is a gemstone associated with planet Rahu (the dragon’s head). In Vedic Astrology Rahu is called a ‘Shadow’ planet or invisible, yet is considered a planet just the same. It emits Ultraviolet Cosmic rays. It cures diseases related to stomach causing digestive difficulty or loss of appetite. It also helps in treating disorders of brain like insanity and in treating of insomnia in particular. Being a cause of eclipse, Rahu can cause to increase darkness in one’s personality, giving rise to desire of criminal conduct, violence, insatiable sexual desires, or other behavioral anomalies. It is supposed to be responsible for all sorts of delays or very late fulfillment of ambitions. If Gomed/Hessonite suits the wearer it helps in achieving speedy success in less time than expected and protects the wearer from misfortunes. It can increase one’s material prosperity, fame or power over others. The chief sources of Hessonite (Gomed) are India, Africa and Sri Lanka. Wearer must consult an learnt Astrologist before choosing and wearing a Gomed/Hessonite. Even though gemstone wearer can yield enormous benefits, he/she can also attract lot of negativity if the gemstone doesn’t match them. It comes in dark reddish/ brownish, orangish colors. Helps the wearer in regard to professional advancement, finance and health. Highly recommended where Rahu is 10th house or/ and person involved in the politics. Those who are involved in legal profession may also wear Hessonite. Very useful for the undiagnosed diseases, where its use facilitates fast diagnosis. It protects the wearer from unforeseen calamities and diseases during voyages. It should be translucent gemstone. It should be in attractive shape and size. Evenness of surface and waxy adamantine finish.